Jonathan is now with a 60-strong group of young people for a WildFire half-term outreach in London. He loves these times, and find that he grows in confidence and maturity with each outreach. Now a few weeks in, Elisa’s job as a care assistant for adults with special needs is working out really well. The job suits her heart of mercy mixed with her initiative and enthusiasm to help people. She takes them shopping, to pick up the children from school, or she might spend time at home with them cooking and cleaning. It is more that full-time and she loves the idea of building savings toward her next big adventure. Linda was invited into the English for Missions classroom to give the students conversation practice. The first question from every pair was, “What do you do here?” It is surprisingly hard to explain to a native English speaker! Support and advising in the Personnel Office continues, and there are many more broader leadership tasks that she’s picking up. Understanding more about Extension Studies now means that she can begin walking it through with new course leaders from around the world. We’ll both attend International YWAM leaders’ meetings from 9-17 March in Amsterdam together, gathering with other leaders within YWAM’s training arm called the University of the Nations. Jonathan’s 18th birthday comes the day after we return, and we can’t wait to celebrate our son’s big landmark day. 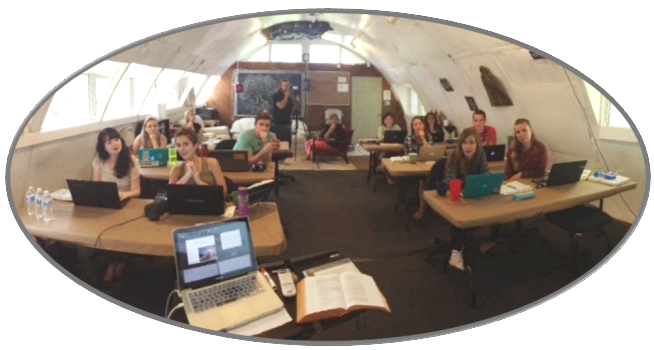 The class Phil is teaching this week in Honolulu this week, he travels to LA this weekend to teach the SBS class there. A cool, cloudy, wet day in Honolulu!! YWAM is an international volunteer movement of Christians from many backgrounds, cultures and Christian traditions, dedicated to serving Jesus throughout the world. When YWAM began in 1960, our main focus was giving young people opportunities to demonstrate the love of Jesus to the whole world, according to His command in Mark 16:15. Today, we still focus on youth, but we have people of almost every age and many of our short-term efforts have grow into long-term endeavours that have impacted lives and nations. YWAM has a decentralized structure that encourages new vision and the exploration of new ways to change lives through training, convey the message of the gospel and care for those in need. We are currently operating in more than 1000 locations in over 150 countries, with a staff of nearly 16,000. We, as a family, have the privilege of being involved mainly in the exciting areas of training (especially in the areas of Biblical Studies and Preaching and Teaching) and those essential facilitation roles that enable the ministry to happen well. USA: For financial support in the USA (and to receive a tax receipt) please send checks made out to Victory Christian Fellowship with a note that it is for Phil and Linda Leage’s Partnership Support, c/o Pastor Brian Severin, Victory Christian Fellowship, 6101 w10th St, Greeley, CO 80634, USA. UK: We are registered recipients with Stewardship, who have set up a support fund for our ministry. You can support us by making gifts to Stewardship for our fund. Where applicable, the value of your gifts may be increased by the use of Gift Aid (worth 25% if you are a UK taxpayer). Please go to www.give.net/20022755 to locate our fund page. Alternatively send to our Nuneaton address.